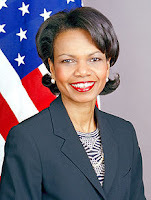 Most powerful country's most powerful woman gets snubbed: Condoleeza Rice's delegation roughed up in Sudan! She is is the most powerful woman in the world. That's what the US and Western media loves to say. After all, who else qualifies better. We are talking about Condoleezza Rice. She is black [politically correct] and born-again Christian [not fundamentalist in case of Christians]. But in Sudan her entourage was allegedly roughed up. Now the papers in America are quite bitter about the episode. We have come to learn that during her visit, the journalists accompanying her kept on pestering Sudan's President with questions and Prez' guards forced the journos and the officials out! The 'mis-treatment' was meted out to some other members of Rice's entourage also. It is a different matter though that Sudan foreign office later expressed regret. But at least, Condi must have learnt a lot after this episode. Particularly, the fact that the whole world won't fall on her feet and there exists a world outside the shores of United States of America (USA). The moral of the story is that power is not universal and one must not get delusional with it. If one Dr Patel is found accused of killing his patients then all practisig medical practitioners with the surname Patel and all the Asian doctors can't be branded as 'killer doctors' or 'bad surgeons' either. That's absurd. But this is happening in Australia. Dr Patel has been termed as Dr Death in Aussie newspapers and the media is screaming. The patients have stopped going to Asian doctors and all those with a brown skin or 'wrong' surname. This is really unfortunate in a civilised society. Just like all Musims branded as extremists, it is also painting everyone with the same brush. However, we don't see a strong and united campaign on such an issue. The VHP-RSS have spread hatred in countries including Britain, US and other foreign countries. Muslim organisations haven't done something great either. Unfortunately the expatriate Indians (NRIs) are more communal. The Asians are split on religious lines in these countries and as a result such battles against discrimination can't be fought together. If Asians Abroad want to learn a lesson they can learn from Dr Death episode. 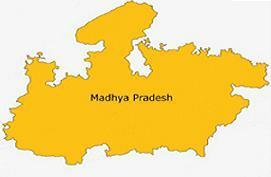 Once again communal violence erupted in Dhar, a historic city in Central India. The violence claimed the lives of two persons. For the last decade this town has become a virutal potboiler and the situation has gone from bad to worse recently. The failure of administration to control the riot doesn't come as a surprise striking because it has become the norm in Dhar, which was once the capital of Sultans of Malwa. The Saffron groups have done their best to turn this peaceful place into the Ayodhya of Madhya Pradesh. 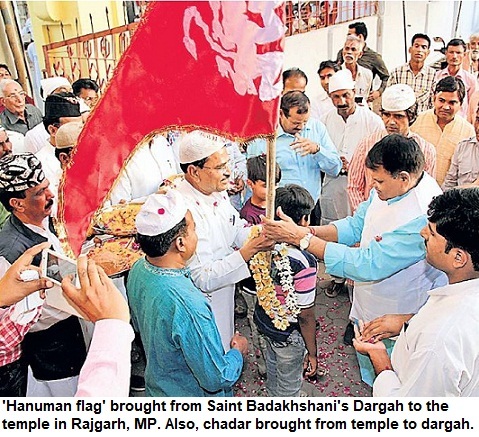 After Jhabua, Dhar is another laboratory for the RSS. The fact that Malwa has considerable Muslim population, minor incidents always get communal turn. Among the sensitive districts of the state are Indore, Shajapur, Burhanpur, Dhar, Ratlam, Neemuch, Shajapur, Dewas, Mandsore and Rajgarh--almost all are in Malwa region. All these districts have more percentage of Muslims that the statewide population percent of Muslims which is just 6.5%. More importantly there are towns in Malwa that have a large concentration of Muslims. Sarangpur, Shujalpur, Sarangarh, Mahidpur and Mhow to name just a few. Over the years RSS has gained from strength to strength in this region. The proximity to Gujarat and the large trader community here are other causes for growing communalism. Unfortunately the police has not been fair and this has increased the mistrust among Muslims regarding the administration. The burqa or the veil that is demonised in the Western world and even looked at suspiciously among non-Muslims in India is proving to be a boon for the young ones. Teenaged girls are preferring to cover their faces. The style is exactly similar to that of a Muslim veil. They cover themselves while going out with friends or even boy friends. One of the main reasons is that middle-class girls when in company of their boyfriends, don't want to be recognised or seen by their relatives. 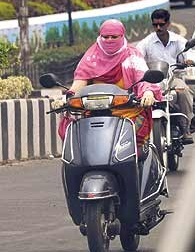 So it's safe to cover your face and you won't have to worry about being identified during a visit to park or a mall. This phenomenon is not restricted to a few isolated places but all over India.In small cities like Jamshedpur, the college authorities are in a fix, how to deal with the problem. The girls take the burqas from a shop on rent before going out on date. Of course, there is no criticism of the practice. It's fashion now. 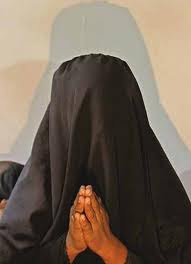 Burqa gives them anonymity and there is no fear being caught by parents or acquaintances. 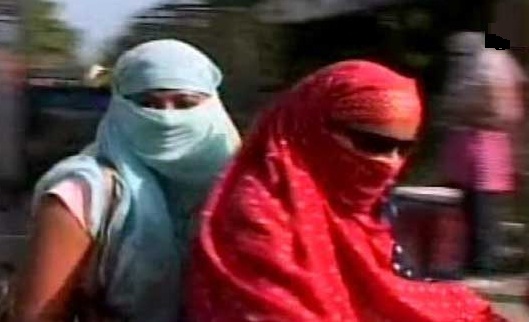 Earlier, girls claimed that they were protecting their skin from the harsh sun in Indian summer by covering their faces. But now, throughout the year, you can see women covering their faces. They use a piece of cloth--like a head scarf or 'dupatta' to cover their faces. Now it has become a perennial sight across India. In all seasons, girls in Pune, Nagpur, Bhopal, Raipur, Ranchi and other cities, go out covering their face and hair, that provides them the anonymity which they need to meet their lovers. Veil has brought this independence to girls, which is otherwise not possible in our society. So how can you say that Burqa restricts. If Muslim girls generally used black burqa [Bohra women wore vibrant veils], then now its colourful veils for all. The Times of India's editorial on the issue of migrants' influx is thought-provoking. The entire nation and the politicians cutting across the party lines have made the issue of Bangladeshi Muslims' influx as the biggest threat to India. Strangely, the Marxists are also crying hoarse like the right-wing BJP used to do in the past over the issue. The communalisation of Indian politics is so intense that on one hand the country has open border with Nepal, the entry of Bangla migrant who is culturally more closer to India is a strict no-no. Lakhs of Nepalese enter India every year just because Nepal is a Hindu country [though culutrally it was not a part of India. But Bangladesh [that was just 57 years ago part of India], is a Muslim country so the migrants are unwelcome. What the Bangla migrant does? He mingles easily and lives peacefully. On the other hand many Nepali domestic helps are involved in crimes but there is no anger against them. Had there been even a couple of incidents of crime by Bangla migrants, the national media would have made a great hue and cry. As long as Hindus came to India from Bangladesh, it was good. The settlements of Bangladeshi Hindus through out the India are reminder to the fact but the last two decades when Muslims started arriving, it has become a big issue. In Assam, we have similar issue that keeps raging perennially. Read an exhaustive post on the same issue that was written later on this blog. 'Branding the Bangladeshi migrant as terrorist: Illegal immigration or a humanitarian crisis'. Read it here. Despite the reports of rise in incidents of crime against ethnic minorities in United Kingdom, the country has largely remained peaceful. Apart from minor incidents of arson, the British have maintained their calm in wake of London blasts. This is in sharp contrast with the manner in which right-wing groups act in India. No sooner than a minor incident occurs, the entire Muslim populace has to bear the brunt of it and also the backlash despite no fault of its own. On one hand, not only Tony Blaire but the entire leadership cutting across party lines has acted with great restraint, urging the people to maintain the harmony, here we have seen how head of states [Chief Ministers] pay least attention even when mobs are out to kill at will. In 1984 Sikhs were butchered on the streets of Delhi after the assassination of Mrs Gandhi. The state slept then and the police had turned Nelson's eye. The press was silent. Everything was hushed up and pushed under the carpet. In 2002, the Gujarat riots saw Prime Minister and the entire central government turn away its face and the Chief Minister Narendra Modi almost supporting the carnage in which thousands were killed and millions displaced. Hats off to you Brits. Linking Islam with Terrorism: What about IRA, LTTE, Hiroshima, Holocaust? Once again the blatant use of the words like Islamic terrorism and Muslim terrorists has angered me. That people do not find it offensive, is strange. 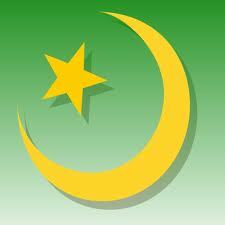 Firstly, as a Muslim, I condemn all forms of terror and terrorism. Secondly, if misguided persons commit such acts, then their act shouldn't be linked to a religion, as we totally oppose such wanton killings and bloodshed. 1. Why the Irish Republican Army [IRA] that indulged in bombing in UK and the deadly Basque separatists in Spain never termed as Christian terrorists or Protestant/Catholic terrorists? 2. Why the LTTE that is Hindu [Tamil is their language and ethnicity] and has killed thousands of innocents including head of states in Sri Lanka besides destroying Buddhist temples never dubbed as Hindu terrorist outfit? 3. The killers of Hiroshima or Nagasaki are just not remembered as terrorists. Do we need to remind the horrors of Japan during the Second World War. 4. The massacre of thousands of Muslims in Bosnia was never termed Christian terrorism, why? 5. The murders by Jews, Buddhists, Hindus and Christian outfits are never linked to religion but only when a criminal is Muslim the entire community is associated. Why the words like Muslim terrorist and Islamic terrorism used in media. Such irresponsible, objectionable and derogatory term is used frequently by mainstream, self-styled liberal media all over the world. This is causing divide among Muslims and the non-Muslims. And even the Muslim intelligentsia does not protest. Strange! It is indeed sad that the London blasts have again put the Muslims on the defensive. The blasts are highly condemnable but the peace-loving Muslims should not be put in the dock for such act of terrorism. The bombings have led to precious lives being lost. But Muslims have also suffered. In Iraq and Afghanistan, the bombings resulted in deaths of hundreds of thousands innocents for whom few tears were shed. Muslims have died in all terrorist attacks. Terrorism is neither Christian nor Islamic or Hindu. It is time to restore our faith in humanity and efforts are needed to ensure that one community is not pushed to a corner. We don't even know who is really behind the terror attacks but unfortunately the suicide bombings and terror have been linked to Muslims. The recent poll that showed Indians as the only country where support for US is highest. As many as 71% Indians hold positive opinion about Americans, the highest in the world. While most of these Indians feel that Americans are innovative, honest and hardworking, the Americans are viewed as greedy, arrogant and immoral by many European nations. It is nothing but the habit of servility, that of licking the feet of the powerful. Also, there is a tendency to align oneself with the power that seen as most anti-Muslim. After all, India is the only country where the poll was conducted just in urban areas. And the urban areas of India have the millions of wannabe yuppies for whom America is the ultimate paradise. So what if these few metros together do not constitute more than 7% of India's population. Let the 93% go to dogs. The Imrana* issue has once again brought to fore the severe divisions among the Muslims in India and their failure to evolve a system to protect the victims belonging to their community who have suffered diverse forms of exploitation. There is not a single nationwide body among Muslims that can rehabilitate the woman. When voices were coming from all sections about what will happen to Imrana, not one bearded Maulana or any organisation could come out saying that she will be protected or offered finacial assitance by us. Unfortunately, all the self-styled Muslim politicians and clergymen are ready to speak on the issue for hours but none could pledge the personal support to her. Even now there is no discussion about such a security system for needy, widow, orphan and other victims of violence in Muslim society. The Waqf properties worth billions that could easily have led to formation of such welfare system are mismanaged all over the country. Either it is the victims of Gujarat violence or the likes of Imrana, the Islamic society in India has failed to rise to the occasion. What's the case of Imrana? Imrana was an uneducated Muslim woman, who lived in a village in Muzaffar Nagar in Uttar Pradesh. She was allegedly raped by her father-in-law. A local panchayat subsequently termed her 'nikaah' with her husband Noor Ilahi has null and void, as she had sexual contact with his father. The Ulema were approached. A controversial fatwa held the position of the panchayat and local clergyman as correct. This set off a wave of anger across the country. TV channels lapped up the case. However, Imrana's husband stood by his wife. Noor Ilahi said that he would not give divorce to his wife. They later shifted to her native place where they bought a small piece of land, through money given by a woman organisation. Her father-in-law was sentenced to ten years of imprisonment and is now in jail.